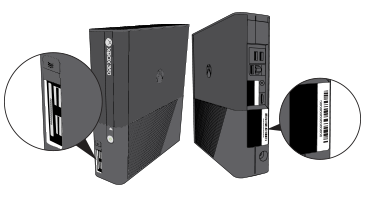 Attach an Xbox 360 Hard Drive to increase the capacity of your console. You can use the Xbox 360 Transfer Cable to transfer content to a new console. For more information, see Use the Xbox 360 Hard Drive Transfer Cable or watch the following video. Watch the video about using the Xbox 360 Hard Drive Transfer Cable. Note This video is available in English only. Use this transfer cable to transfer content between any two Xbox 360 hard drives (Xbox 360 S Hard Drive or original Xbox 360 Hard Drive). This older transfer cable can transfer content from an original Xbox 360 Hard Drive to any Xbox 360 console. Store or move up to 16 GB of content with the Xbox 360 USB Flash Drive by SanDisk (preconfigured). This is compatible with both the Xbox 360 S console and the original Xbox 360 console. Note You can use other USB flash drives to store up to 2 TB of content. Configure these flash drives as memory units to work with the Xbox 360. To learn how to format a USB flash drive for an Xbox 360 console, see Xbox 360 USB flash drive support. Store or move up to 512 MB of content. The table below details what types of content can be stored on a hard drive, a USB flash drive, and an Xbox 360 Memory Unit. Important When you format a storage device, it erases all of the information saved on that device, which can’t be recovered. Make sure that you don’t want the information stored on that device, or that you’ve backed up the information to another device before you continue. If prompted to enter your console serial number, do so, and then select Done. This step helps guard against accidental formatting. The console serial number is located on the back of the console, and behind the oval door on the front of the console. You can rename an Xbox 360 Hard Drive, an Xbox 360 Memory Unit, or a USB flash drive. Note The storage device name can’t exceed 26 characters.